Ecological restorationist David Bender has cleared invasive trees (visible in the background), and is planting endangered native plants like the one in the foreground. 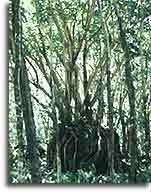 Deep, dense and destructive, the Schefflera actinophylla ("octopus") tree is invading this 1,000-acre nature preserve on northwest Kauai. Able to grow even on boulders, the population has exploded from five before the 1982 hurricane to an uncountable number today. Alien species -- sometimes called "invasive exotics," are wreaking havoc on Hawaii, in effect using biology to destroy biodiversity. Hawaii is not used to newcomers: The nearest land is several thousand miles away, and an estimated 25,000 or more years used to pass between colonizations by new species. These days, a new plant or animal arrives every 18 days. We did the math -- that's at least 50,694,400 percent faster! Banana poka is a vine that carpets native forests. Strawberry guava is a scrubby tree whose fruits are beloved by birds -- which spread their seeds. Schefflera, or octopus tree, is grown in nurseries as an ornamental plant. This pest has carpeted the Limahuli valley, a preserve on the wet North Shore of Kauai owned, ironically enough, by the National Tropical Botanical Garden (NTBG). You don't have to search for the boring, shady stands of Schefflera in the preserve, which is literally carpeted with the stuff. What's striking is that before Hurricane Eva in 1982, the valley had only a handful of the trees. "The rain forest was so thick, you could barely walk through," says preserve director Charles Wichman. The eye of the storm blasted through the valley, clearcutting trees and bushwhacking shrubs, until the place was "denuded to bare dirt," he says and invaded by weeds, particularly the prolific Scheffleras. But aren't hurricanes natural? Yes -- but. Before the onslaught of alien species, natives would have recolonized the area. "Two thousand years ago, recovery would have been natural," Wichman says. "Today, you no longer have natural recovery, with all these alien seeds waiting to get in there. The result is the ecological disaster that plagues the Limahuli valley -- a nature preserve that can't be protected by a line on a map. Eradicating invasive plants is expensive, especially in Hawaii's steep terrain. In the Limahuli valley, for example, about 1,000 acres are infested with Schefflera and other exotic species. David Bender, an ecological restorationist with NTBG, is hard at work, sometimes with a small crew, reversing the infestation. The process is simple but laborious: Cut the invader, put a dab of herbicide on the stump to stop resprouting, and plant natives in the cleared ground. It's simple, but daunting. The hauntingly beautiful, 1,000-acre Limahuli valley preserve is overshadowed by an imposing lava spire that served, in the musical South Pacific, as the legendary mountain "Bali Hai." Stretching from the ocean to more than 3,000 feet in altitude, the preserve could provide an exceptional locale for the Garden's mission of preserving native plants. But it's unlikely that much land will be restored. The forest is thick, the slopes are steep, and the money is just not available. Even with an institution like the NTBG to provide backing, Bender estimates that in his most optimistic dreams, only 2 percent can be cleared of invaders and replanted with the trees and shrubs that lived on Hawaii 200 years ago. Looking on the bright side, Bender says, "It's surprising how many plant you can put on 20 acres," after the invaders are cleared out. But don't just blame plants. In Hawaii, introduced mammals are a huge contributor to plant extinctions. Remember, before the Polynesians , Hawaii's only land mammal was a single species of bat. Lacking a need for spines, toxins and thorns, native plants lost these adaptations, making them lunchmeat for herbivores. Sheep, and particularly goats, climb some of the steepest slopes, stripping vegetation in their path. Black rats, brought by Europeans, climb trees and eat eggs and young of forest birds during the night. Rats' destructive role is becoming clearer and leading to poisoning campaigns. Feral pigs, which eat endangered species and create wallows beloved by mosquitoes (which were brought by Europeans). Pigs "rototill" the forest, creating an ideal seedbed for invasive plants complete with a drop of organic fertilizer. 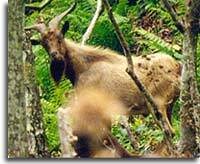 Non-native pigs and goats like this billy cause enormous destruction in the native forests. It's hard to find anyone opposed to rat extermination, if it can be done safely, and most environmentalists favor eradicating pigs. "The conflict [between introduced grazers and natives species] is the biggest environmental-political issue we face," says Lonnie Ziegler of the Earth Justice Legal Defense Fund in Hawaii. But hunters in Hawaii favor the status quo, which involves widespread problems with feral animals, and vehemently oppose restrictions on hunting, let alone extermination campaigns. "Getting rid of goats and pigs, even from the most sensitive areas, is a thorny issue," says Wayne Jacintho, a lifelong hunter on Kauai. "I don't believe [most hunters give ecological damage from goats and pigs] any credence." Many hunters, he says, see their role in positive terms, because hunters kill the damaging grazers. But hunters have also organized politically to fight snaring campaigns against pigs -- and snares -- noose-like traps that progressively tighten as the animal struggles, are much more effective than guns. Finally, like many conservation issues in the state, the issue touches on the status of native Hawaiians. According to Kai'opua Fyfe, a member of the Native Hawaiian Convention, many native Hawaiians feel the traditional Hawaiian government was "overthrown" by the United States in 1893. The Convention has started legal action, including a petition to the International Court of Justice in the Hague. The ultimate goal, says Fyfe, whose father was Scottish and mother was native Hawaiian, is secession from the United States. At the least, he'd like natives to get a "state-within-a-state" status like that held by Native Americans. Do any rare plants survive on these disturbed islands?